We are following up the upcoming Honda BR-V SUV quite closely. 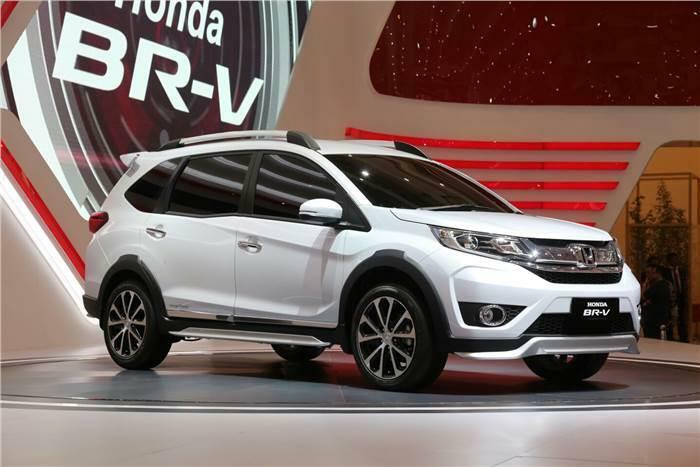 As expected, Honda has now unveiled the all new BR-V at the GAIKINDO Indonesia International Auto Show (GIIAS) 2015. 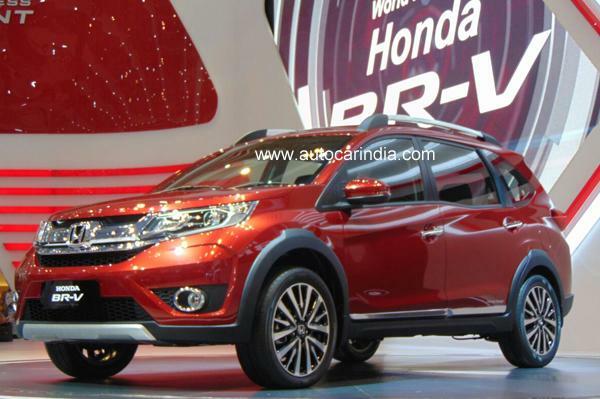 Honda says that the BRV SUV would first go on sale in Indonesia and shall make it to India in 2016. New Honda BR-V is coming in 7-seat configuration and is potentially going to take on heavy weight rivals like Hyundai Creta, Renault Duster and Ford EcoSport in India. Talking about the design of new BR-V as noticed by observing pictures taken at International Auto Show which happened at Indonesia, this new car sports a squarish look in the front, and has a chrome-laden grille and a unique new headlamps that has projector beam plus chrome inserts. BR-V’s front bumper gets a more wider air dam and 2 chrome-ringed fog lamps. Once could also observe the matte silver faux skid plate at the lower end of the car’s bumper. When you look at the car’s side angle, Honda BR-V very much resembles Honda Mobilio MPV as it has similar-looking doors plus window-line and has a additional ground clearance with 16 inch alloy wheels. Honda BR-V also gets roof-rails plus the additional body cladding on the doors in order to give it a much better SUV appearance. In the rear end of the car, the tailgate does not come with a mounted spare wheel and shall feature a large LED tail-lamps that are connected via a very thin strip. Honda BR-V car gets a unique dashboard design. Honda BR-V’s new dashboard falls inline with the upmarket Honda City sedan & Honda Jazz than Brio, Amaze or Mobilio. The dual-tone layout would get a darker shade with a silver border separating it from bottom half. Honda BR-V is expected to use same steering wheel with mounted controls as that of Honda Mobilio and Amaze. The BR-V shall also sport a separate AC vents for the 2nd row passengers. 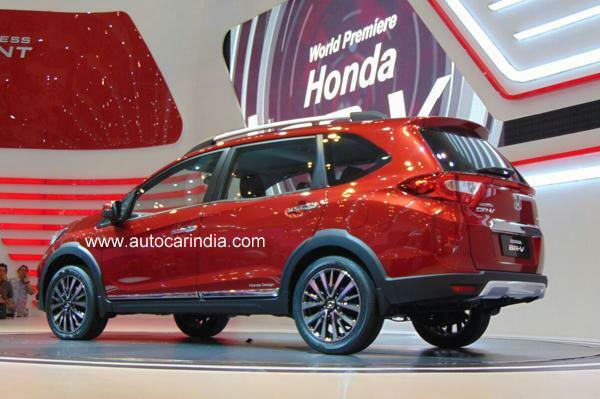 Thanks to AutoCarIndia, here are new photos of Honda BR-V as taken at Indonesian Auto Show. Honda BR-V SUV has been showcased in 2 new colours: White and Red. These are better pictures and matches the sketches/photos initially shared by Honda team. Under the hood, Honda BR-V for Indonesia is going to be powered by 120bhp 1.5 litre petrol engine which is mated to a 6-speed manual or CVT gearbox. For India launch, Honda could have already planned the diesel engine that might give more power. Talking about the safety features of the car, Honda BR-V shall get dual front airbags, ABS and EBD with Vehicle Stability Assist system. Looking to buy Honda BR-V car in India? Then you will have to wait for the unveiling of India-spec Honda BR-V at Auto Expo 2016 which is scheduled to be held in Delhi in 2016.